Well, this is really weird. I had always believed Hillary was a poor choice of candidate, and while I voted for her, I did so with a sense of dread, knowing the intense reservoir of hatred for her that had accumulated ever since she famously said she wasn't going to stay home baking cookies. And it was clear from the extraordinary success of the Sanders campaign that the political left, just like the right, was in no mood for more of the same, and no candidate epitomized the Washington elites more than the woman who had been groomed for the presidency since she set foot in Washington. Those of us who trust signs and omens more than number-crunching poll wonkery couldn't help but see the looming orange clouds on the horizon despite being told, repeatedly, that we were being silly because there was simply no way such an inept, bullying demagogue could win. Last night I drew three cards, again from the well-shuffled majors (22 trumps) of the Golden Tarot of the Renaissance (Estensi tarot, c. 1470). It has become my go-to deck for current affairs because it has been so uncannily accurate. I asked about the near future of Trump's presidency—what's going to happen? 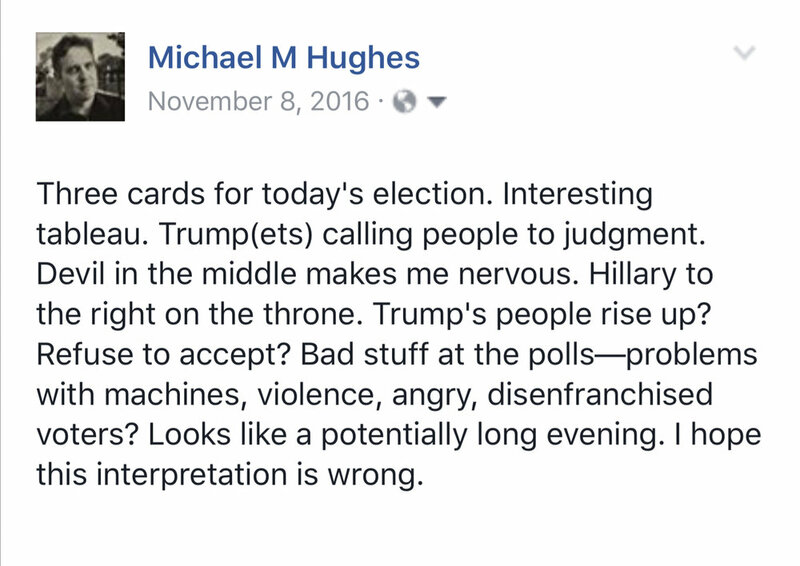 The same two cards—Judgment and The Devil—in the same order, that I drew on election day morning. You are welcome to calculate the odds, but it is undeniably odd. And the third card: The Tower. As in You-Know-Who's branded towers. And it's crumbling. And on fire. It took only a few seconds for the narrative to gel. Trump's tower is crumbling—his name, his brand. Blasted and falling to pieces. But he's still standing, defiant as ever, jabbing his hand in the air, and his people are still heeding the call of his Trumpets. And what is that blue, earth-like sphere above the tower—might that be the weight of the entire world hastening the destruction, as demonstrated so tangibly by the millions of people around the globe who took to the streets to express their dissent? So, what are these cards telling me? Donald Trump continues to spectacularly combust. He's falling to pieces in front of us with every vacuous boast, every stroke of his executive pen, and every brazen lie (he hates, for example, when someone suggests his thing is smaller than someone else's thing). But his people, his most fervent supporters (the MAGAts, as I've come to call them), continue to heap praise on him, and with every burning chunk of the tower that falls they cheer even louder. Short answer: expect more of the same, and don't waste your breath trying to "reach out" to his supporters because they're still deaf to anything but the crass patriotic music blasting from his trumpets. Or perhaps, looking at his sequence of cards through another lens, that crumbling tower is our country.